My husband and I stayed at Kolea 4F for our honeymoon at the end of September and it was perfect. We spent every morning walking along the beach, checking out the tide pools and the turtles, and every evening watching the sun set from the lanai with a glass of wine and some fabulous local goat cheese and crackers we found at the nearby gourmet store. It was heaven. The condo is even more beautiful in person than in the photos and definitely has the best view of the ocean from any unit in this development. While we were there, the resort was pretty quiet, which suited us well. The pool area is gorgeous and not crowded and the beach is beautiful. We chose to stay in a condo rather than a hotel because we planned to fish and wanted to be able to prepare some of our own meals. The kitchen is well equipped, there wasnt anything we needed that we couldnt find in the cupboards. Ive stayed in many vrbo units around the world and this one was far and above in the best condition. Its very well maintained, not like some other short-term rentals. The property manager was friendly and accommodating and I received my full deposit back promptly after we left. I would highly recommend staying in this unit. Lovely townhouse in Mauna Lani! We spent one week at Kulalani 2001 and had a refreshing visit. The unit was spacious for our family of three, clean and tidy and the checkin was as expected. The property manager was very helpful in providing more hangers and laundry baskets for our unit and there was plenty of supplies on hand for the week. The location is an excellent launching spot to see the rest of the island and our favorite benefit is the access to the private beach club area with the restaurant. The place was lovely. We enjoyed the 8 night stay at your place. I definitely plan to return! Thanks for being a great host!! Very Nice Indeed We had been staying with friends so this was a nice change. Typically we dont go for the plush carpets and manicured lawns, but it was a nice treat and just like the photo. The lap pool and workout room were great and we visited them everyday. Not as close to the beach as I would have liked but I assume that adds $$$. From what we found, you have to drive every in Hawaii. The great beaches of Hapuna and Mauna Kea (get there very early) are wonderful. Mauna Lanis beach is great for young kids and older folk who want to sit and read. Not as good, my daughters tell me, for snorkeling. Place was clean, spices on hand for cooking and a good selection of beach necessities - chairs, towels, fins, boogie boards. Mahalo. Beautiful, peaceful, luxurious A very clean, quiet, well-appointed, top of the line everything, convenient condo in the best location. The view of Hualalai and fish pond from the kitchen is simply picturesque, and the breeze and view from the lanai so pleasant. So nice to conveniently wash nd dry the clothes on a daily basis. Huge fridge, microwave were great too for storing leftovers and heating quick breakfasts. Only a short walk through the nice beach club to "A Bay". Can walk to shops with the best convenience mart, food court, restaurants (we could live of the breakfast/lunch plates, cut fruit, and real Japanese sushi like natto handrolls from the market). Ten-fifteen minute drive to GREAT beaches and historic/natural scenery, free hula shows, petroglyph tour, etc. All this luxury and convenience really made the difference in our vacation. Great Unit in Mauna Lani Resort Great value for money. Unit is very clean & well equipped. Wendee was fantastic to work with and even got my buddy a unit at last minute in same complex. Had a great time, plenty of room. Only reason it doesnt get 5* is the view was limited to foliage. Still, for the price, it was fantastic! Beautiful and roomy condo in a great location on the big island. The building is a 2 min drive to the pool and very close to the entrance / exit gate. Both bedrooms are very large. The master suite is very nice with a large bathroom and walk in closet. The second bedroom is also large. We had three teenagers in the room and they were comfortable. The space had everything we needed from the kitchen to beach items. The condo was very clean and well maintained. The patio faces west and is well protected from the winds. The entire complex was very quiet. Great view of the ocean, comfortable and clean. Responsive property manager. Would definitely recommend this! We certainly enjoyed our time here! The location was perfect for exploring the area - per Alans suggestion we went to 69 mile beach for snorkeling which was amazing, as well as Place of Refuge, Kona, and lots of other sights. We had two days where we never even started the car - lots to explore in easy walking distance, including a petroglyph trail, shopping, snorkeling and swimming with sea turtles at A-Bay (less than 5 min walk from the condo), dinner at Lava Lava Beach Club etc. It was nice to have a grocery store and shops to walk to as well. The condo complex is beautifully landscaped with a lovely pool and hot tub area where our kids (8 and 11) enjoyed evening swims. And finally, the unit itself was impeccably clean and well-appointed. Cooking was thoroughly enjoyable with the grill on the lanai, and fully stocked kitchen, with new top-quality appliances. Communication with our hosts was easy and we appreciated the quick and friendly responses from Wendee - although we hardly needed to be in touch as everything was so well thought - out and welcoming. Thank you for sharing your home with us! We hope to be back! Aloooha! My family and I had an incredible time Wendee! The condo was absolutely perfect and my parents loved all the nearby shops! We cant wait to return! My wife, 18 and 22 year old daughters and I had a fantastic stay at the Waikoloa Beach Resort, Halii Kai 18D for 10 days (March 26 - April 4). The 2 bedroom / 2 bathroom condo is large and spacious, the kitchen is very well equipped, the bathrooms are modern, all the furniture / appliances / dishwasher / clothes washer / dryer / outside grill are well maintained and in very good working conditions. We appreciated all the amenities: beach towels, beach umbrella, boogie boards, tennis rackets, etc. The unit is on the top corner overlooking the tennis courts, and the outdoor patio faces the west. The entire area is very quiet. (Incidentally, we did not see one fly / mosquito / bug around the property nor frankly in our entire trip including driving around the entire island; a relief since we had heard about the dengue fever concerns prior to travel.) The unit is a 5 min walk from the pool / club house (lovely medium sized pool next to open air fitness pavilion and bar where the food is served.) This is where you need to go to see the spectacular sunsets. Halii Kai is a 5 min car ride to the nearest beach - Anaehoomalu Bay (known as A-Bay). All the beaches in Hawaii are open to the public. A-Bay Beach is in front of the Mariott and is ideal for snorkeling - just walk along the southern shoreline all the way out past the Lava Lava Beach Club (which is where you will find plenty of public parking). 9 miles north on Hy-19, go to Hapuna Beach which is rated #1 in USA - white sand, clear blue water, the cleanest beach I have ever seen (including Caribbean / Mexico / FL etc.) And 1 mile north of Hapuna is Mauna Kea resort with public beach access as well - it is as nice as Hapuna, and 25% smaller. You will need to get to Mauna Kea before 8-10am to gain access to the limited (40) parking spaces; after which they close the public access. If you like beaches, go to these three. The Kings / Queens market place featuring upscale groceries are within the Waikoloa Beach Resort, and only a 5 min car ride. For better value, drive 6 miles northwest to the Waikoloa Village Market, which is very good. And then for the best value drive south to the Costco in Kona. 20 miles northwest along Hy-19 to Hilo, youll find Waimea and great local restaurants - Hawaiian Style Cafe serves monster breakfasts! 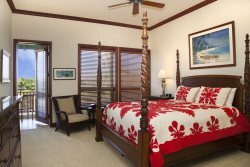 The Host (Kohala Luxury Rentals) was very responsive to all our questions prior to arrival and during our stay, and this was very much appreciated. Thank you for a wonderful stay! We had a wonderful time! Views are spectacular and we spent lots of time the lanai with coffee in the morning or wine at sunset. Wendee (property manager) was extremely responsive and helpful...both in the reservation process, before we arrived and during our stay. Wed love to go back. We have stayed at numerous places in Hawaii and have visited the islands numerous times and this place was one of the best. Everything was perfectly maintained and clean. The location was private and close to all the shops and restaurants. We will definitely be back to this place every time we visit Kona. Absolutely perfect condo for us and another couple. Well stocked to make our stay easier and furnished beautifully. It is always hard to judge what you are going to get when you book online - but this place lived up to the description. It had everything our family of 4 needed. Centrally located to beach / pools / shops - it was great. It was big enough for us to spread out in and just enjoy. We would love to come back and thoroughly recommend this property to future guests! Lovely, quiet place to stay We thoroughly enjoyed staying in this condo at Halii Kai. The home was spotless, comfortable and had everything we needed. We very much appreciated having staples in the kitchen as most of our meals we prepared ourselves. The pool is fantastic as well as the exercise facilities. We would definitely come back! Great place, had everything we could hope for. Airy, open property with wonderful amenities. Very comfortable, easy walk to the pool and the beach. Would definitely stay there again! It was extremely clean and the owners helped us by putting twin beds in the second bed room so our girls could sleep more easily. Modern kitchen. Wonderful! Perfect Wonderful condo and location. Beautiful property... Our family (my husband, myself and our two teen agers) recently returned from a 10 day stay at Kulalani. We were more than impressed with the condo and property. it was so nice to have two levels, two washrooms and the washer and dryer. There were boogies boards, pool noodles and a large cooler for the beach. (My only suggestion would be adding a smaller cooler for drinks etc.). The condo was extremely clean, the beds and pillows were amazing and the manager Wendee was wonderful to deal with. Mahalo for letting us enjoy your condo! Beautiful property and area First and foremost, the attention and service you receive from the Manager, Wendee, is five star. She went above and beyond with any question or concern we had and always responded in a timely manner. That made our vacation great before we even left home. Wonderful service. The set up is perfect for privacy if you are two couples or a family with kids as there is the upstairs master suite and the downstairs bedroom with a bathroom as well. The townhouse is exactly as pictured and has all of the amenities you need. It is a little worn on things youd expect in a rental - the carpet, etc and the glass door in the bathroom is a bit of a pain if you are bathing little ones but those are MINOR compared to how beautiful and spacious the unit is. It is conveniently located near the rec centre - literally a 1 minute walk away. The pool isnt heated but was refreshing with the heat of the day. The garden view off the lanai is really lovely - we loved having our morning coffees and evening beverages out there. Our 4 month old daughter thoroughly enjoyed laying out on a blanket listening to the birds. Paradise! You are a drive to your beach but its quite kid friendly and in a little cove. Its a really central location as well to see most of the sites of the island - half hr south is Kona, half hour north is Hawi and the Pololu lookout, and about an hr and a half away is Hilo. Also the most beautiful beaches on the island (Mauna Kea, Hapuna, both must sees!) and a 5-10 minute drive away and GORGEOUS! Hawi is a must see as well - such a chill little town with lovely shops and art galleries. The condo has boogie boards and pool noodles as well as beach chairs and coolers. All the things you need to make a lovely beach day. We adored our time on the Big Island and this townhouse worked perfectly for us. If you like snorkelling, take the time to make it to Kahaluu Beach Park, was tons to see and so beautiful. Also, where we spotted the most turtles was in the rocky beach area of Puako. So many cool places to see! Thank you so much for being a part of our wonderful vacation to Hawaii. The villa was perfect and we enjoyed our time there. We picked Kolea 4F as the base camp to celebrate our mothers 90th birthday and we are so glad we did it was great! The penthouse was even better than the website description and the support from property management both before and during our visit was excellent. Spacious rooms were made even more so by the high ceilings of the penthouse and an entire window wall in the dining room folded away to make an indoor-outdoor room with the lanai. Third floor location adds to the outstanding view across a vacant lot to the ocean. A daily show of kite surfers and chorus of birds made life even more interesting for lanai sitters. We dined al fresco several nights. We were pleased with the complete kitchen supplies including many staples that made making meals a pleasure. Furnishings and accoutrements are of nice quality. The location was good for walking to the pool, beach, petroglyphs, and shops or mounting car expeditions to other parts of the island. Villa came with snorkel gear, beach towels, boogie board and beach chairs. Great villa, great location, and great service made for a memorable and delightful stay at Kolea 4F. Great Unit! We had a great visit in this unit. It is immaculate and exactly as photographed. Very comfortable beds and very responsive manager/owner. It is very new construction, which is nice - everything is solid and new. The homeowners beach is really great - perfect swimming cove, excellent snorkeling and a great restaurant.